The LUCID 4-Inch Folding Mattress is an excellent folding mattress, perfect for travel and kids. This mattress is small enough when folded up to take anywhere, yet still comfortable for sleeping. The LUCID 4-Inch Folding Mattress has the added benefit of folding up into a chair. There are three panels to this mattress, one of which folds in half itself, creating a back for the chair. This added feature makes the LUCID 4-Inch Folding Mattress an excellent choice for those with limited storage space. When you’re not using it as a bed, the mattress is still functional. The LUCID 4-Inch Folding Mattress is made of a polyurethane foam. It’s not as supportive as memory foam, and doesn’t have the same density. Larger adults may find this to be a problem, but the foam used is still very comfortable. Most adults can comfortably lay on this mattress without sinking to the floor. You won’t wake up feeling stiff and sore after a night sleeping on the LUCID 4-Inch Folding Mattress. The mattress comes in a wide variety of sizes. You can choose from a standard twin size, twin XL, full, full XL, or queen size. The sizing options make the LUCID 4-Inch Folding Mattress an excellent choice for those with small living quarters who want to maximize their space. The queen size is the perfect guest bed for adults. 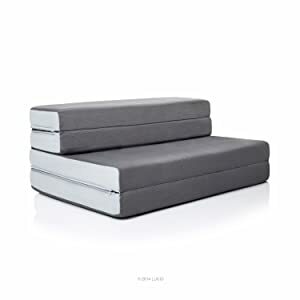 The dense foam makes more comfortable than a couch or futon, but the LUCID 4-Inch Folding Mattress can easily be folded up and stored away. This mattress is truly ideal for kids. The LUCID 4-Inch is a great addition to a kids play room or bedroom. You can unfold the mattress for a playtime mat. The durable cover can withstand roughhousing without ripping or tearing, and spills are easy to clean off this mattress. The cover is also removable for easy washing. The best kid-friendly feature by far is the mattress’s ability to fold into a perfect kid-size chair or couch. 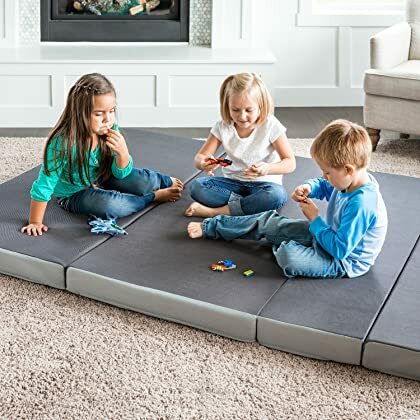 Kids will love sitting on the mattress while watching movies or playing video games with friends, and it can still be folded up and stored away when you don’t need it. The LUCID 4-Inch Folding Mattress is also a great option for travel or camping. When folded up, the twin size mattress is small enough for one person to carry easily, and it weighs less than 20 pounds. Even the larger sizes are fairly lightweight. All sizes come with handles on the side for easy transport, so you won’t be left trying to lug around an unwieldy cube. However, the LUCID 4-Inch Folding Mattress does have its drawbacks. While the foam is comfortable enough for most people, it can’t compare to memory foam, and if you’re a light sleeper you may notice a big difference between this and a memory foam mattress or a traditional spring mattress. At 4 inches, this mattress should be thick enough for most people to lay on without sinking to the floor, but this will depend on the size of the person. The LUCID 4-Inch Folding Mattress ships in a vacuum-sealed bag, so you’ll have to open the bag up and give the mattress time to air out and expand to its full size. Some customers have complained that their mattress didn’t expand to a full 4 inches in height, but this isn’t a common concern. The mattress does have a chemical smell as it expands, but this true of most foam mattresses. Within a few days, or even just a few hours, the smell will go away. If you’re going to be sleeping on the LUCID 4-Inch Folding Mattress, you’ll want to purchase a fitted sheet to put over it. The cover on this folding mattress is high-quality and durable, but it’s not quite so soft that you’d want to sleep directly on it. Overall, the LUCID 4-Inch Folding Mattress is a great mattress for the price. It’s perfect for kids to play on or to fold up into a chair for extra seating. The mattress is easy to carry around for travel or camping trips, and it’s still comfortable enough for almost anyone to sleep through the night on.